In 1988 my parents organized the first family reunion for me and my 5 siblings, our spouses and children. At that time there were 17 of us. Today we number 34. And yet, every 3-4 years most of us have been able to gather together at the beach, thanks to the generosity of Mom and Dad. My mother had mixed feelings about having another reunion after his death in November of 2012. But she and Dad had always said these reunions were one of the best investments they’d ever made. They took great joy in watching their children and other family members have fun together and form strong bonds. And so, Mom decided she wanted to continue the tradition. 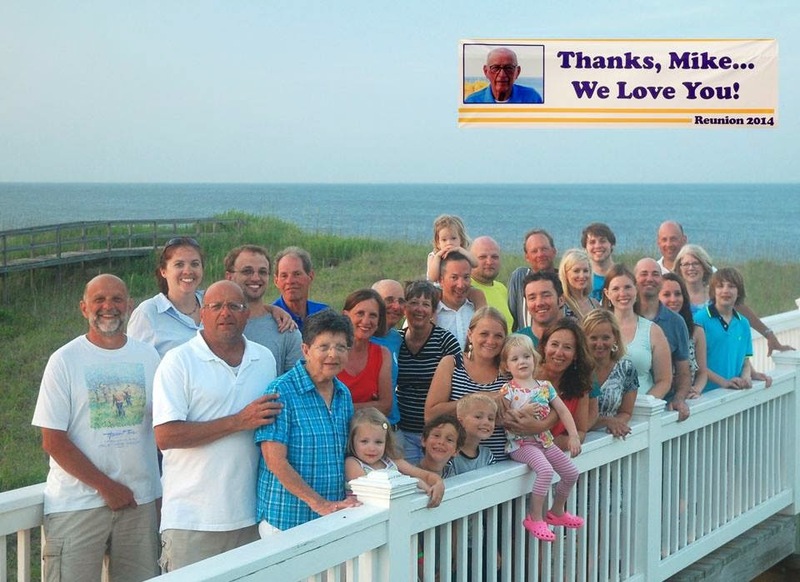 We all came together last week at the Outer Banks of North Carolina. What she and the rest of us didn't know was that my sister’s husband Gary had figured out a way for us to “see” Dad all week. Gary designed a banner that included our favorite picture of Dad from a previous reunion, along with purple letters and gold lines (LSU colors). During dinner the first night, Gary slipped out with two of the guys and hung the banner so it would be visible anytime you looked out from the house. When he came back inside, he guided Mom over to the gigantic sliding doors. The rest of us followed behind. The tears flowed freely at the moment we all looked out and saw that beautiful tribute to the man who’d made these reunions possible. Every day we could feel Dad’s spirit with us as we ate meals, laughed together or played in the pool below the banner. We knew he’d take great pride in the fun we were having. The banner had to be taken down Thursday evening as the threat of Hurricane Arthur loomed near. But that wasn't the end of it. Friday evening Gary spread the banner on one of the dining room tables and encouraged everyone to write a note on it, expressing what the week had meant to them. Reading those beautiful, heart-felt messages stimulated more tears and hugs as we reminisced about Dad and what he’d meant to our family. As I now reflect on that special week, I’m filled with gratitude for the legacy Dad left to his children, grandchildren and great-grandchildren. Yes, we’ve been enriched by his thriftiness and generosity, which made these special times with family possible. But more importantly, we continue to aspire to be better human beings because of his own humble, kind and sensitive nature. His spirit will inspire us for the rest of our lives. How fortunate to be born in a family like this. This ideal is uncommon in the modern world. Yes, Denny, we are all aware of how rare our family is. And we are grateful every day for it! The example was set by our very special parents. You want to adopt a 50 year old? Awesome tribute that speaks volumes to your family's strength & character. Adam, love your comment. You are not the first to ask about joining our family. Over the years, many friends have said to me, "Do you know how lucky you are to have the kind of parents/family you have?" I have always said YES. I've recognized for a long time how rare it is to have the kind of love and support we share. I would like to be adopted, too, Meredith! Even more,I wish my two adult daughters, now 33 and 35, would take time from their busy schedules to get together with us! That happens so infrequently these days. Many of my friends have the same issue with their adult children who live almost totally separate lives. The turning point seems to be when adult children marry, buy homes, have children, "settle down." But many young adults choose not to do that these days. It's almost as if there are the "traditional" types of families like yours (lucky you!)... and then there are the others! Maybe my daughters will become more "traditional" in their 40s! I hope so! What a beautiful story. My mother was one of nine sisters and, for as long as I can remember, the family managed to get together for a Christmas party and a summer picnic. I don't know the exact number for that tribe but I know it is close to 200. All but two of the sisters are now gone and the next generations have not been as faithful in gathering everyone together. Susan and I have three children and five grandchildren and can't seem to get everyone together at one time anymore. My how the world has changed. Yes, you have something very special and precious and your note should cause all of us to pause and plan to do better. As one of my favorite authors has said, "relationships are all there is". Camille and Rick, what we found works is to set the date way in advance. Everyone blocks their calendar and holds that week sacred. Each event reinforces commitment to future ones because we have such a good time together. It's never too late to start!